Chipset-maker Qualcomm has today announced its new Clear Sight dual-camera system. Clear Sight is not designed for optical zooming, like the dual-cameras in the LG G5 or iPhone 7 Plus, but instead adopts a similar concept as the Leica-branded dual-camera setup in the Huawei P9. Both lenses have the same focal length but one captures image data on a color sensor, the other on a monochrome imager. The sensors are technically identical but the monochrome variant does not use a color filter. This means it cannot record any color information but in turn can capture three times as much light as the color sensor. As a result the black and white images have better contrast, lower noise levels and increased sharpness. By merging the image information from both sensors, color is added to the final output image. This task is handled by Qualcomm’s Spectra ISP which is featured in the company’s Snapdragon 820 and 821 mobile chipsets. 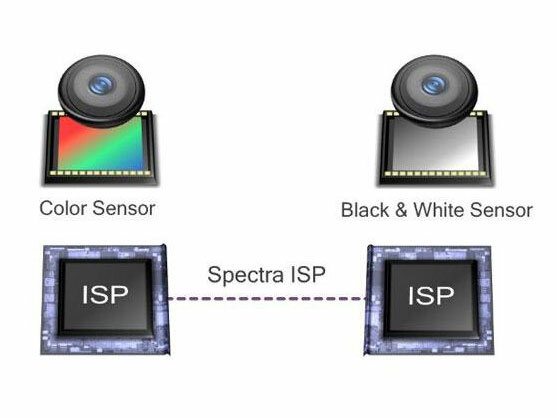 Clear Sight consists of a hardware module with two cameras, plus the corresponding computational algorithms that enable the Spectra ISPs to capture both images at exactly the same time and merge them. Qualcomm has not yet provided any detailed specifications, nor do we know what upcoming devices will feature Clear Sight. It certainly looks like dual-cameras are here to stay, though.